It is common knowledge that we are in desperate need of a means to both reduce environmental waste and develop alternative renewable resources. The following papers by Roger A. Sheldon and James H. Clark, both published in Green Chemistry, outline research on the production of chemicals from food supply chain waste (FSCW) biomass. [1, 2] A fundamental aspect of green chemistry is preventing pollution rather than mitigating waste. This involves substituting non-renewable fossil fuels including crude oil, coal, and natural gas. Renewable biomass has been seen as a potential sustainable resource for the manufacture of chemicals and liquid fuels. While first-generation biomass feedstocks (maize and edible oil seeds) may compete with food production, second-generation bio-based fuels use wasted biomass. These waste products include sugar cane bagasse, corn stover, rice husks, and orange peel. The most sustainable means of achieving this is to create value from this unavoidable waste biomass generated during the production of edible crops. Thus, FSCW can serve as a resource for the production of bulk chemicals that are made on large scales to satisfy the global market. The estimated global production of biomass amounts to approximately 1011 tonnes per annum, of which only 3% is cultivated, harvested, and used in food and non-food applications. By using specific chemical syntheses to process this biomass waste into commercial chemicals we could replace the vast quantities of chemicals currently produced from petroleum hydrocarbons in traditional oil refineries. Thus, the carbon footprint of chemicals and liquid fuels can be reduced by switching to renewable FSCW as a feedstock. 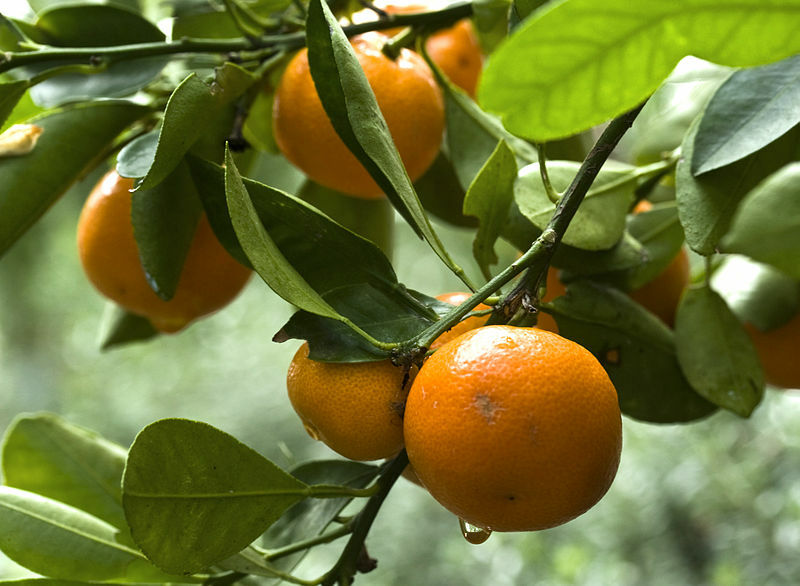 Citrus fruits are a promising biomass of which approximately 82 million tons were produced in 2010-2011. The peel of citrus fruits generated by the juicing and canning industry have the potential to be used as a biorefinery raw material. In his paper, J. H. Clark describes the Orange Peel Exploitation Company project that produces large quantities of known marketable and high-value chemicals such as D-limonene, pectin, and flavonoids from waste orange peel using a low-temperature hydrothermal microwave process. Ultimately, by using all components of food supply chain waste we are protecting the environment in more ways than one. In these two papers, R. A. Sheldon and J. H. Clark certainly give very convincing arguments as to the production and use of biomass resources. But is this really a feasible alternative? What volume of FCSW would be required to maintain the current production of commodity chemicals? What do you think? Could biomass be the future of chemical production? 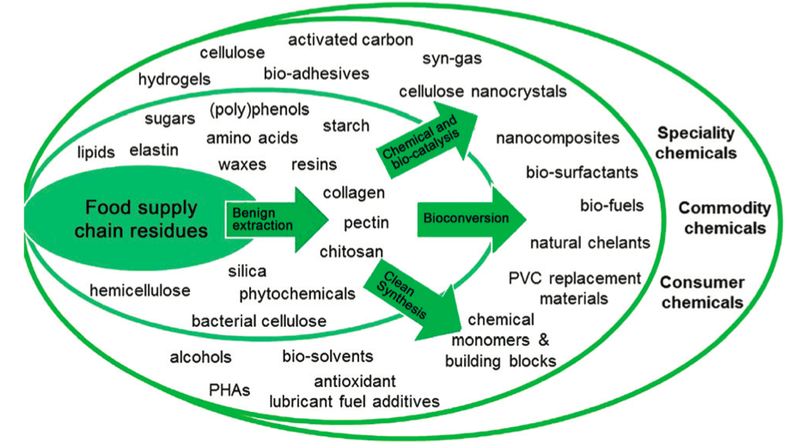 R. A. Sheldon, “Green and sustainable manufacture of chemicals from biomass: state of the art”, Green Chem. 2014, 16, 950-963. L. A. Pfaltzgraff, M. De bruyn, E. C. Cooper, V. Budarin, and J. H. Clark, “Food waste biomass: a resource for high-value chemicals”, Green Chem. 2013, 15, 307-314. This entry was posted in Green Research, Shivanthi Sriskandha. Bookmark the permalink. This is interesting but also disturbing information about chemicals infiltrating our food and water systems, and ironically, through processing and distribution of foods, and related services. I hope individuals and corporations began to pay more serious attention to this issue, and figure out a way to lessen the negative effects of mass production and distribution of goods in this country, and worldwide. Thank you for sharing the article. It’s very cool. Hope to hear more from you. Thanks for sharing this kind of informative information regarding Chemical Products. I wait your next upcoming updates from you.